We couldn't pass up a gorgeous day early in September so we looked for an easy road trip - Swords Castle would fit the bill! We were thrilled with the light there but a bit disappointed that we could not get inside the bawn - it was closed for restoration and no notice of when it would open again. Yet the park grounds made for a delightful walk around the roughly pentagon- shaped wall enclosing about 1.5 acres, with the fortified tower house and extensive gateway complex and chapel forming part of the wall. 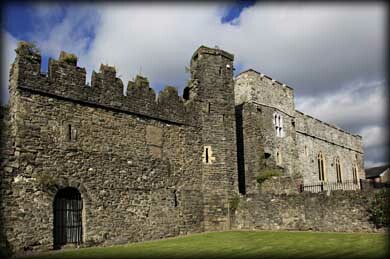 The castle was constructed around 1200 to serve as the residence of the Archbishops of Dublin. 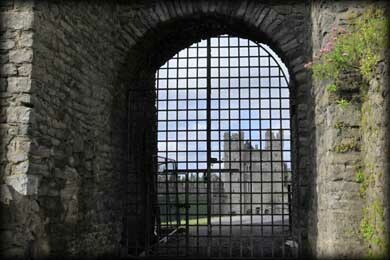 The beautifully arched entrance gate is flanked by two square towers with slit windows. An adjoining chapel (to the right of the gate and tower, seen in the photo above) was built in the late 13th century, perhaps as the Archbishop's private oratory. It has been re-roofed as part of the restoration but new materials were used rather than what would have been available when originally constructed so it appears much newer than 13th c. Other buildings have since vanished, including a documented great hall. 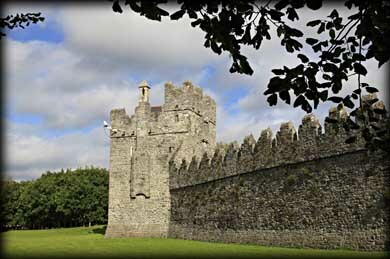 The Archbishops moved to a new palace in Tallagh in 1324, and the castle went into private ownership until purchased by the Fingal County Council in 1976. We are looking forward to returning to tour the tower house when the restoration is complete. Situated: Take the M1 north for 10 k and take a left turn for Swords. The Castle is at the northern end of the main street. Discovery Map 50: O 1820 4696. Last visit Sept 2012.